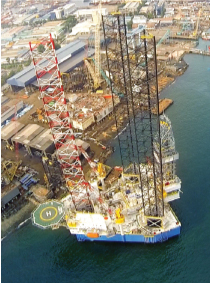 Perisai’s first Jack-Up Drilling Rig is a PPL Pacific Class® 400 with technologically advanced drilling capabilities. The Rig is designed and equipped to drill high pressure and high temperature wells as deep as 30,000 feet. It is also capable of operating in water depths of up to 400 feet, capable of doing offline activity while drilling, can be jacked-up with full pre-loading tanks and has full service accommodation for 150 personnel. .